To earn the ENERGY STAR, a light fixture must be energy efficient and produce high quality light. The compact fluorescent technology used in many ENERGY STAR fixtures allows a new range of choices for high quality, energy-efficient lighting. Whether you're designing a bright kitchen or a softly lit nursery, you can find an ENERGY STAR qualified lighting fixture to fit your needs. An ENERGY STAR qualified fixture uses far fewer watts than an incandescent fixture to produce the same amount of light. The energy savings are significant, and that means lower electricity bills. Light output is measured in lumens at the light source. To determine if the light is bright enough, be sure that it produces sufficient lumens to meet your needs. Ask your lighting supplier for advice on how much light you need for different parts of your home. Different light bulbs emit different colors of light. Lighting color ranges from cool to warm tones, and is known as color temperature. The color temperature of a light source indicates the color of the light emitted measured in degrees Kelvin. Color Temperature is not an indicator of lamp heat. 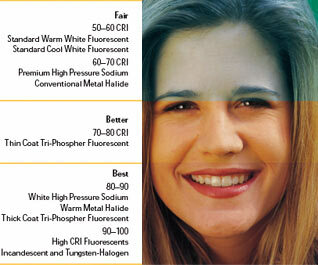 The chart below shows a range of color temperatures, from warm to cool. Even at a given correlated color temperature, color can vary. To avoid such variation, EPA recommends you purchase bulbs from the same manufacturer at the same time. Ask your local lighting retailer about rebates for ENERGY STAR qualified lighting fixtures. Color rendering index (CRI) is a measure of how accurately an artificial light source displays colors. CRI is determined by comparing the appearance of a colored object under an artificial light source to its appearance under incandescent light. The higher the CRI, the better the artificial light source is at rendering colors accurately. High (above 80) CRI is preferred in the home. ENERGY STAR requires that qualified fixtures have lamps with CRI above 80. Every fluorescent fixture has an electronic component called a ballast. A ballast is used to boost the electric current to start the bulb and to regulate the flow of current to the bulb. An electronic ballast, ensures quiet, rapid flicker-free startup and operation. A magnetic ballast, unless ENERGY STAR qualified, may blink on startup, flicker slightly and/or hum during operation. There are an increasing number of ENERGY STAR qualified fixtures produced by dozens of manufacturers in a wide range of styles to meet your lighting needs. Lighting showrooms, hardware stores and other retailers throughout your area stock energy-efficient ENERGY STAR qualified light fixtures. If you don’t see the products you want, let your local retailer know. They’ll appreciate it! Even the way we light our homes can make a real difference in our utility bills and to the planet. ENERGY STAR qualified fixtures and bulbs meet high standards for energy-efficiency and quality, so they use less energy without sacrificing performance or design. Plus, they’re safe, reliable, and provide just the right light and color. Today’s ENERGY STAR qualified lights equal or surpass the quality of light found in conventional incandescent bulbs. And since energy-efficient bulbs use 67–75% less energy and last as much as 6 times longer than other bulbs, you’ll save on energy bills plus the cost and trouble of replacing bulbs. Now more than ever it’s easier to save money, conserve natural resources, and protect the environment in our everyday lives.